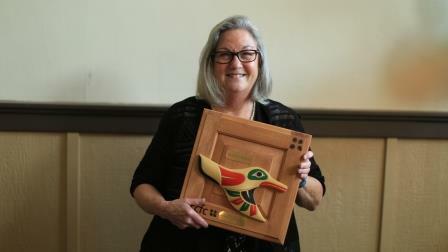 The 2016 Linda Nelson Community Champion Awards were presented on June 15, 2016 by the Skagit County Child and Family Consortium. 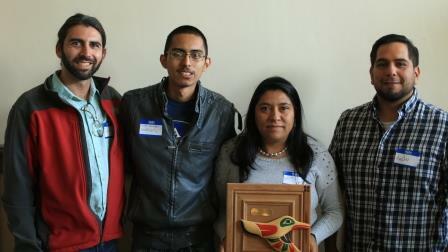 Award recipients received a special hummingbird carving gifted from a local artist, Kevin Paul. The hummingbird generally symbolizes joy and playfulness, as well as adaptability. Symbolically, the hummingbird also represents: lightness of being ~ enjoyment of life ~ being more present ~ independence ~ lifting up negativity ~ swiftness, the ability to respond quickly ~ resiliency. All these characteristics and more are represented in our award recipients. Congratulations to you all and thank you for your commitment to children and families in Skagit County! Heather worked for over 27 years as a public health nurse. Her work included a variety of programs, largely serving vulnerable children and families. She transitioned from 25 years of early intervention and support services to families referred by Child Protective Services populations to working primarily in the Nurse-Family Partnership program. This program provides home visits to first-time, low-income mothers and their families from early pregnancy until their child’s 2nd birthday. In her professional life, evidence-based practice, primary prevention and ACE/NEAR research are her passion. She carries this passion into her personal life as a foster mother to infants with special needs, where she has been able to see first-hand the powerful impact that safe, stable, nurturing environments can have on children who have experienced early adversity. Heather deeply valued each of the families she worked with, recognizing them as the experts in their own lives. She worked hard to support people from traumatized and disadvantaged backgrounds, focusing and building on individual strengths. She carried hope for each client, supporting them in their own goals for a more successful future for their families. Nurses don’t often know “the rest of the story” from their clients when services end, but Heather has had the privilege of seeing formal clients years later who were in a much better place thanks to the support that they had from Heather as their nurse. The 21st Century Community Learning Center is run by a community of practitioners who believe in the power of holding individuals accountable to their best potential. The bottom line of the after-school program is safety. Physical, emotional, and intellectual well-being is a thread in all of the program offerings, activities, and social situations. Staff members actively listen to students and make sure that all sides of a story are heard so that students feel welcome and safe in the program. Students have commented that the after-school program is a safe place for them to be. Some students would otherwise return home and be alone, as their parents are working multiple jobs and long hours to make ends meet. Because of our program, one mother commented that her four kids are cared for while she and her husband earn a living for them all. Another mother said that the social safety we provide after school allows her son to shine in personality and character growth. Another commented that her daughter has the confidence to dance and be active, despite having developmental disabilities.The program has served 135 students over the course of the year, but the active roster hovers around 94 students and they average 68 participants each day.